Grab the top spot in your industry by seizing the power of IoT. Smart products are everywhere. They're in our companies, in our homes, in our pockets. People love these products. But what they love more is what these products do - and for anyone running a business today, outcomes are the key. The Internet of Things (IoT) is the point of connection between products and the results they deliver - it's where products become software. IoT Inc. explains everything you need to know to position your company within this powerful new network. And once you do, you'll leave the competition in the dust. 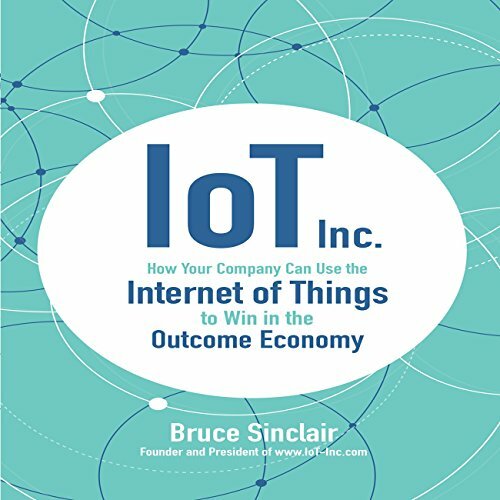 Founder and president of today's leading IoT business consulting firm, Bruce Sinclair has been helping companies develop IoT strategies for a decade - far longer than the term has even existed. This essential guide provides an in-depth look into IoT - how it works and how it is transforming business; methods for seeing your own business, customers, and competitors through the lens of IoT; and a deep dive into how to develop and implement a powerful IoT strategy. IoT isn't a new business trend. It's the new way of business. Period. The IoT wave is heading for your industry. You can either meet it head-on and ride it to success, or you can turn your back and let it swamp you. This is your playbook for transforming your company into a major player in the IoT Outcome economy. A great number of technical innovators will be learning about business as they venture in to IoT products and markets. I think Mr. Sinclair's book would help those individuals become oriented to a business perspective and vocabulary. Loved the book! it is enlightening, organized and straight to the point. It tackles IoT from three different perspectives: Technology, Business & Strategy. These are the main points that appeal the most to business executives and entrepreneurs. A must read book! this book blends business and technical concepts very well. Neither too "markety" nor technically "in the weeds," Sinclair provides engineers and business decision makers with a toolbox of information so that they may ask better questions of where, how and, most importantly, *why* Iot should be used. Tremendous overview and strategic insights! absolutely recommend to any friend who is investing in or working in IoT. A great balance between understanding the technology and understanding the business. That's a difficult balance and Bruce Sinclair walks the line perfectly for my taste. I am a Product Manager in Silicon Valley and I found the balance of biz and tech refreshing. What was one of the most memorable moments of IoT Inc.? Thinking about the outcome economy and what this means for not only IoT, but all of business was fascinating. Also how to think about your competitors and your potential future competitors. If you are in the business of IoT then have your executive staff or even all your employees read IoT Inc. Get them thinking about how what they deliver contributes to the outcome economy, new business models, new partnerships. All these important strategic thoughts will be brought out and challenged by IoT Inc.
What did you love best about IoT Inc.? Written from a manager engineer level, which I am. Which character – as performed by Scott R. Pollak – was your favorite? no, need time to process ideas in chunks. I highly recommend this book to anyone wanting to build an IoT device at any level. great learning experience, I spent whole weekend to listen to this book as it is so interesting and insightful too. I listen to audio books while taking a walk or while driving and this is one of the few that really made me stop and make bookmarks. As someone new to the industry I found quite a few gems here, especially the emphasis on value creation and selling outcomes instead of products. Such concepts are nothing new, but the author explained how they clearly apply to IoT offerings. The technical section is not something for beginning IoT engineers who I think will benefit more with a presentation similar to the OSI layer for networking, but it extensively discusses what you need to cover from choosing devices to analytics and security. Would you listen to IoT Inc. again? Why? Just because of its rich content that can be used as reference. This book is great for anybody willing to learn about IoT and how it affects business models. Bruce is a seasoned executive who can talk about the business benefits of IoT as well as technical challenges that we need to take into consideration when travelling the IoT journey.